In 2017, an estimated 4,751 people slept rough in the UK on any given night, a figure that was more than double that of 2010. That something needs to be done about the rising homelessness problem is evident, and in Cambridge the homelessness charity Jimmy’s Cambridge is doing great work, but raising awareness by starting conversations about the issue is equally important. Cold Turkey, written by Joy Hunter, and directed by Jonathan Iceton, is a play which explores the alienation and dangers of being homeless during the festive season, and imagines what it might be like to invite somebody in to share the Christmas cheer. The play opens with alternating vignettes of the chaotic Christmas Eve of a middle class family, and a homeless man called Nick (Archie Williams), who is just trying to get some sleep in the local graveyard when he’s distracted by none other than Santa Claus. Nick is a character who is understandably cagey about himself, but we feel like we know him by the end of the play, and Williams manages to tread the line between the frustrations of a life that is ‘no life really’ and a man who is loving at heart. Meg Coslett was a believable struggling mother as Gabs, pitching the stress level just right for a woman trying to juggle the difficulties of preparation and present wrapping while doing her best to keep her daughter’s dreams alive, and drinking copious amounts of wine along the way. Grandad (Rob Ryan) is amusingly uninterested and Aunt Mabel (Tilda Borrows) trots in on her high horse to complicate things. 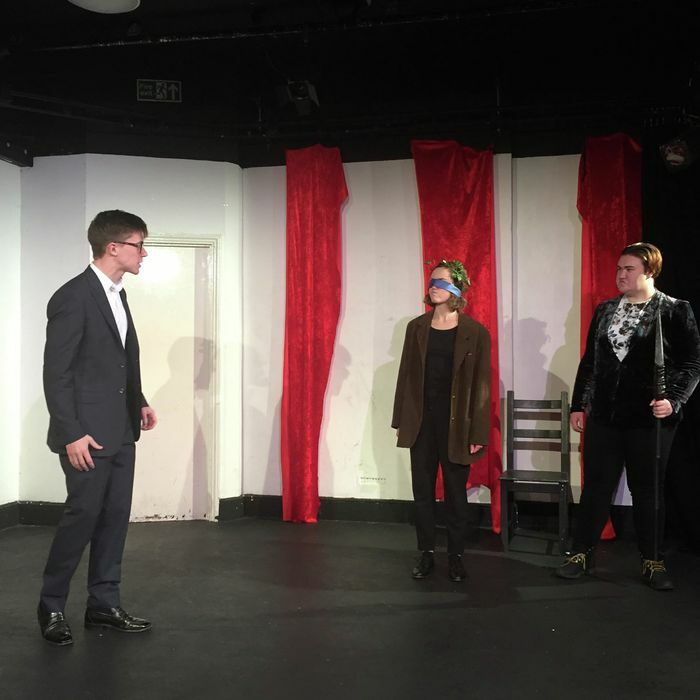 The daughter, Eve, is played with appropriate excitement and inquisitiveness by Georgina Deri, who has nailed the tone and mannerisms of a girl in year five. She also proves herself to be a versatile actress, in the shifts of character when multi-roling, and as Nick’s mother (in his memory) she delivers the most touching moment of the show. The cast really felt like a family, and Iceton must be praised not only for good direction in getting the dynamic right here, but also for stepping in as teenager Christopher last minute (due to cast illness) and doing a fantastic job. However, Iceton eating the (cold) turkey had everybody giggling to the point at which they lost themselves completely. This wasn’t beyond saving until somebody asked ‘what’s my line?’ Were this a comedy show that could afford to be metatheatrical, it might not have been as frustrating, but this was meant to be a family at a dinner table. I was disappointed that the cast couldn’t get themselves back on track without admitting they had fallen off, not least because they had been so impressive up to this point. Eventually, they managed to compose themselves and move on, and, funny as the moment may have been, I was happy to get back to the script. On that note, the script was effective and sensitive, with just enough humour to counterbalance the very serious points at the heart. The plot twist and the ambiguous ending suggested a sophistication which was great to see in student writing, and Hunter should be proud of the concept and the execution. On the whole, this was helped by strong performances all round, and any criticisms I have are minor. For example, lighting changes were effective when used, such as in Nick’s memory, but I felt there were a couple of missed opportunities to do similar things later, particularly at the shelter when it could have been clearer whether the back stories were meant to have been actually spoken or not. These stories were not explored deeply, but they did give a sense of the variety of reasons people end up homeless, and Hunter’s approach to this difficult but pertinent subject was considered and mature. This is a heartfelt show, with a poignant yet funny script exploring identity, sincerity, and belief, and the performances brought out the charm of the story, as well as the bittersweetness. Apart from the loss of control in the middle, which I assume was a one-off so discount in my rating, the show deserves 4 stars. The team are donating 50% of proceeds to Jimmy’s and collecting on the door for this great cause, which they have definitely demonstrated to be worthy of consideration and donation, at Christmas time as much as any.